Some of the latest news out of 2015 San Diego Comic-Con includes a new and amazing movie trailer for Batman v Superman, we have a new pic of (Green) Arrow's new costume, a bit about the upcoming Green Lantern movie and some Flash stuff. First up is this epic looking new trailer for Batman v Superman from Warner Bros that they released at Comic-Con. It must have been intense for attendees to see this. As it is, it's pretty intense to see now! Notes: In the alternate timeline that this movie is loosely based on, The Joker had killed Robin. Who the hell is Wonder Woman fighting? I have no clue. Oh god, an origin tidbit about Batman? Seriously? Argh. In the Warner Bros panel in Hall H at Comic-Con it was noted that the upcoming reboot of their Green Lantern property will not be a solo character hero movie, but rather, an ensemble movie titled Green Lantern Corps. I'm guessing since they couldn't swing a solo character movie, they're going the way of the Guardians of the Galaxy route. There are fantastical rumors that Chris Pine might be playing Green Lantern, but that is seriously unsubstantiated so far. 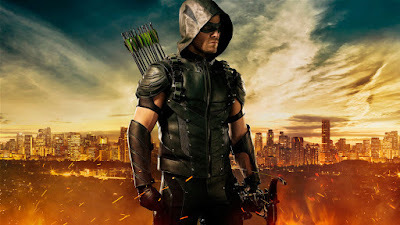 WB and The CW revealed the Arrow's new look/costume for their upcoming fourth season of Arrow, and the new suit looks pretty badass. It was announced today Teddy Sears will be playing Jay Garrick and Shantel VanSanten is going to play Patty Spivot, a police officer obsessed with metahumans. There's also rumors of Wally West showing up in season two. Zoom will be the primary bad guy for the second season and in the SDCC highlight reel, we hear Tom Cavanagh's voice. The first four minutes is a recap of the previous season, after that, is some new content, including the new, blue light that the Flash will be trailing behind him instead of the yellow lightning look. Or at least in this clip, his wake is blue.